Time: 01:37:51 am, 3 October, 2011. The LHC is producing million collisions per second in its detectors. But at that time, one collision is “more special” than the others in the LHCb detector: the milestone of 1 inverse femtobarn of luminosity is surpassed. What was considered as “mission impossible” at the beginning of the year is now “mission accomplished”. 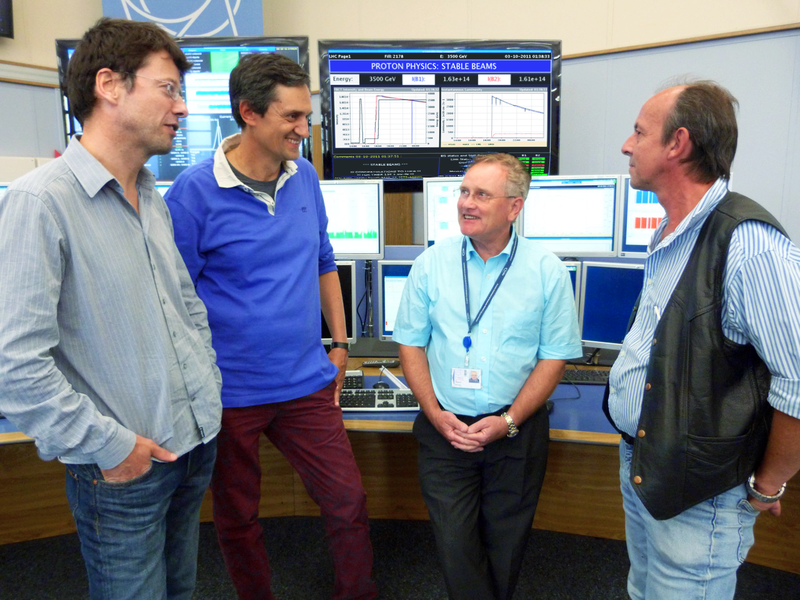 Mike Lamont (Operations Group Leader), Pierluigi Campana (LHCb Spokesperson), Steve Myers (Director for Accelerators and Technology), and Paul Collier (Head of the Beams Department) celebrate the LHCb milestone. At the beginning of this year, such a high luminosity seemed a very challenging objective. The excellent performance of the LHC, several months of hard work and a new strategy changed the situation. “Early this year, at the Chamonix meeting, we discussed applying luminosity leveling systematically – something which we had only proposed and tried a few times in 2010. By slightly displacing the colliding beams with respect to each other at the LHCb interaction point and continually reducing the separation, LHCb can run flat at the highest luminosity for entire fills while preserving the collision rate for ATLAS and CMS,” says Richard Jacobsson, LHCb run coordinator. 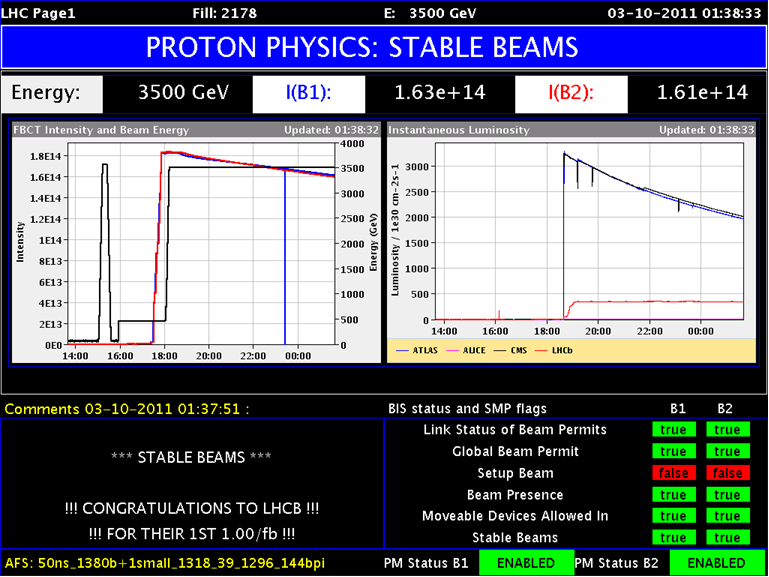 The LHC1 screen congratulates LHCb for its new record. Although sometimes theory differs from practice, thanks to the tight collaboration between the LHC and LHCb, this time the idea worked and the LHCb experiment has been running at full steam since then. “The huge amount of data collected so far will allow us to significantly increase the accuracy of our results. It also increases the statistics of various rare decays and makes their study possible. Moreover, we can now think of exploring new avenues and processes that we never imagined having access to so early,” says Pierluigi Campana. The new explorations could include studies of time-dependent charge-parity violation in the Bs system that could be hiding still unknown processes, and the measurement of the γ CKM angle whose value could provide a better knowledge of the quark interactions as well as hints of new physics. “The results we presented at the summer conferences were based on a set of data that was only one third of what we have now. We expect to have extended our knowledge about a variety of physics phenomena, some of which might be unexpected, in time for the winter conferences at the beginning of next year,” says Pierluigi Campana. The LHCb detector will continue to collect data until the LHC switches from protons to ions in November. It will also be fully operational during the two-day proton-ion run, scheduled a few weeks from now. "LHCb - A Beauty Experiment", a short documentary on LHCb, has been shortlisted by the NHK Japan Prize Festival. Every year, the festival awards the very best in global educational media. The film was produced by the CERN Visual Media Office. Watch the film below, or visit Youtube to see the film in different resolutions or with subtitles.